Over the past year, several Washington Department of Ecology (DOE) employees organized and centralized much of the agency’s data on lakes and aquatic pesticide use on lakes, which had been scattered across several pages and was hard to find. Staff created a map-based searchable site at https://fortress.wa.gov/ecy/coastalatlas/tools/LakeDetail.aspx. Site visitors can type in their lake of interest, and relevant data, maps and photographs (if available) will appear for that lake. Below is an example of what is available for one lake. The page also works for small screens, but the map will be optional rather than display automatically. You can switch to a satellite view or other options by clicking on the ‘Basemap’ dropdown. 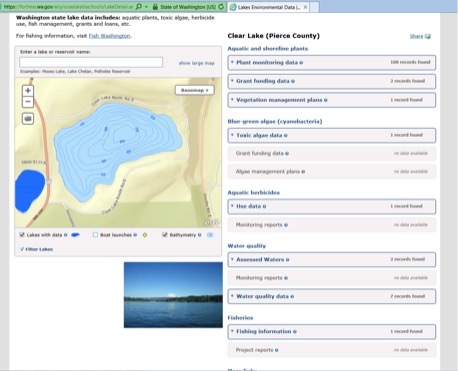 Click on ‘Filter Lakes’ to search for all lakes where a specific plant grows (e.g., Eurasian milfoil), or data for lakes in a specific county. ‘Aquatic and Shoreline Plants’ has data from aquatic plant inventories, grants and links to aquatic plant management plans, if available. We are still working to post reports from grant-funded aquatic plant management projects, so check back for those. ‘Blue-green algae (Cyanobacteria)’ has a link to the toxic algae database and information on any algae grant funding. ‘Aquatic Herbicide’ has information about aquatic herbicide permits for aquatic plant control and any monitoring reports that might have been done. ‘Water Quality’ has information on whether the lake has been found to be impaired for water quality criteria. This section also has links to reports from the days when Ecology had a lake monitoring program (something we currently lack) and to available water quality data. ‘Fisheries’ has a link to Department of Fish and Wildlife (WDFW) fishing information, and any information on fish management treatments that Ecology has permitted. ‘More Links’ leads to Ecology’s database for links to other studies done on this lake. We hope this website proves helpful and interesting to users. Our intention is to continue to improve the site, so please send any comments to Jenifer Parsons at Jenp461@ecy.wa.gov . Nominate your favorite lake hero for the 2015 Secchi Disk Award!